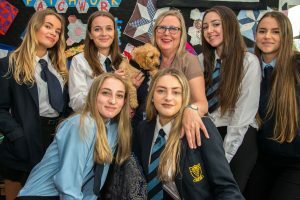 Omari Tretherras, is a miniature Golden Labradoodle that serves as the school’s Pets Therapy (PAT) dog. As part of the NT Wellbeing programme, Omari has been introduced to the school in order to provide emotional and physical support in the educational setting. Local businesses Howden’s, Kayes Chemist, Gentle Dental, Cornish Landscaper Dury’s Chemist, Newquay Lions and the Newquay Tretherras Parent Teacher Association have all shown interest in enhancing the mental well-being of the school and donated funds in order to sustain the project. Clifton Villa Veterinary Services are also supporting the project by providing health care for Omari. 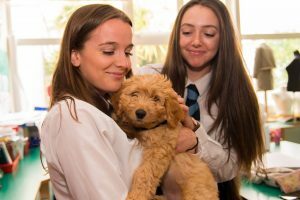 PAT dogs have shown to increased attendance, increased levels of wellbeing amongst students and staff, and encourage reluctant readers who benefit by feeling less judged when reading. 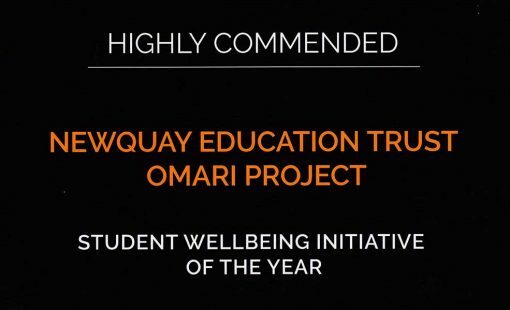 Omari will spend time at both Newquay Tretherras and Newquay Junior and work with students in The Wave Centre, the library as well as attend lessons when requested. Omari will also attend school events and trips.